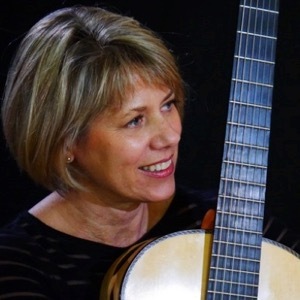 Beverly Davis has been involved in plucked string ensembles since the 1980’s when she studied classical guitar with Reed Desrosier and performed with the Keene State Guitar Orchestra, one of the first such ensembles in the USA to tour internationally. She continued her work with the Providence Mandolin Orchestra. As President of that organization she has organized numerous international tours and also directed the 2001 International Festival of Mandolins in Providence, Rhode Island. She has performed in a duo with Mark Davis since 2001, and as the guitarist in TRIO 868 (2 mandolins and guitar). Recent concert tours with Mark Davis and TRIO 868 have taken them to the Perth FAME Festival (Australia)., Festival Mandolines de Lunel (France), Eurofestival 2010 (Germany), Festival Ciudad de Cristal (Spain) and the Sydney FAME Festival (Australia). Beverly and Mark Davis performed the premiere of John Craton’s double guitar concerto “Flowers of Spain” in the Netherlands with Het Consort directed by Alex Timmerman. At her home in Connecticut, USA, she helps direct the North Meadow House Concert Series, presenting many important rising stars of the guitar and mandolin world.